A shed that had been on the Northeast Harbor property of billionaire Mitchell Rales sits Saturday, Dec. 3, 2011 outside the Harbor House building on Herrick Road in Southwest Harbor. Town officials in Mount Desert told Rales to remove the shed, which had been installed at Rales' estate without the town's approval, so Rales donated the structure to the Southwest Harbor nonprofit. MOUNT DESERT, Maine — A billionaire who was told by local officials to remove an unapproved shed that had been installed at his Peabody Drive estate has donated the structure to a nonprofit organization in Southwest Harbor. The 10-foot-by-20-foot shed was moved Friday from Mitchell Rales’ property in Northeast Harbor to the Harbor House Children’s Center on Herrick Road in Southwest Harbor. Rales, a billionaire estimated by Forbes magazine to have a net worth of $3 billion, recently completed construction of a $24 million mansion, plus accessory buildings, on an oceanfront lot on the eastern side of Northeast Harbor. The shed was built off-site but placed on his property near Peabody Drive as part of the construction project. In late October, Mount Desert Code Enforcement Officer Kim Keene sent Rales a certified letter, telling him the shed had not been approved along with the rest of the project by the town’s planning board. Keene wrote in the letter that not only has the shed not been permitted by the town, but the addition of the shed to the property has resulted in more lot coverage than the town allows in the zone where the property is located. On top of that, the shed is located within the 50-foot setback from Peabody Drive, which also is a violation of local ordinances, the code enforcement officer told Rales. She told Rales in the letter that the shed had to be removed or Rales would face possible fines. Keene said Thursday she recently had been contacted by Noel Musson of CES Inc., an engineering firm hired by Rales to make arrangements to have the shed removed. She said that, after sending her letter to Rales, she did not take further enforcement action against the property owner. “I knew they were working on it, so I didn’t pursue it,” Keene said. Musson said Thursday that the shed was installed at Rales’ property as a result of a “misunderstanding” of the town’s zoning ordinances. When Rales found out the shed violated local ordinances, Musson said, he decided to donate it to the nonprofit Harbor House, a Southwest Harbor community services organization that serves Mount Desert Island. Ingrid Kachmar, executive director of Harbor House, said Thursday that the organization was “excited” to be given the shed. She said Harbor House recently decided to stop renting a storage unit in order to save money and that the gift of the shed will allow them to keep some items they were expecting to give or throw away. 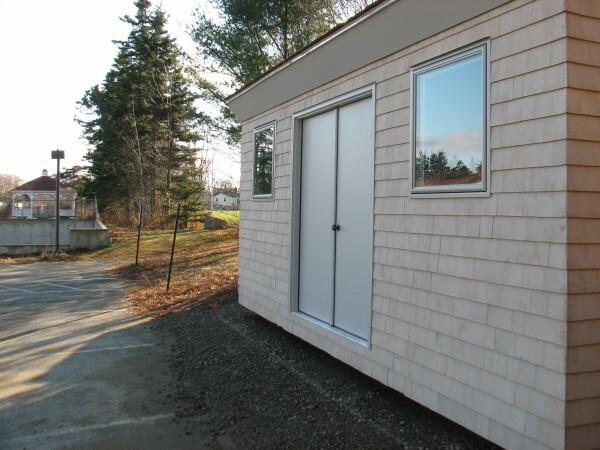 “We’re delighted he thought to give the shed to a nonprofit here on MDI,” Kachmar said. Rales, who co-founded and still controls Danaher Corp. with his brother Steven Rales, lives in the Washington, D.C., area for much of the year. The Danaher Corp. is a global firm that designs, manufactures and markets professional, medical, industrial and commercial products and services. Company stocks trade on the New York Stock Exchange under the symbol DHR. Mitchell Rales bought the property from the estate of Susan Mary Alsop, the late Washington socialite, in 2007 for $5.5 million. After purchasing the property, Rales had Alsop’s former home razed and then built four buildings on the 4.4-acre parcel, including his 17,000 square-foot seasonal home, which contains 8,100 square feet of finished living space, according to the town’s online assessing database.